With a Monday deadline looming for uninsured Americans to sign up for health care coverage, the Obama administration yesterday announced it would give more time to those who had tried to enroll in a plan through the federal insurance marketplace, but were unable to complete the process. 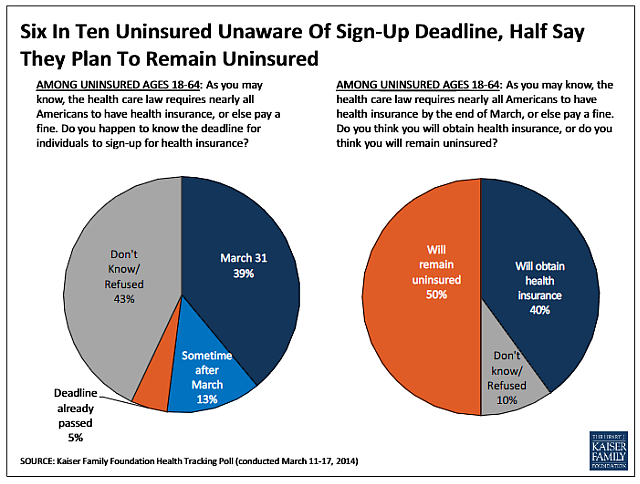 However, many uninsured had not known the deadline was upon them and about half said they would remain uninsured, according to a Kaiser Health Tracking poll conducted March 11-17. Under the health care law, those who do not obtain coverage for 2014 face financial penalties of up to 1 percent of their yearly household income, or $95 a person, whichever amount is higher, although even before the deadline extension was announced, there was an array of exemptions for hardships and other reasons. While most Americans know that the law includes fines for those who do not buy coverage, Kaiser found that just 39% of the uninsured were aware of the Monday deadline. About four-in-ten (43%) said they didn’t know the deadline (or refused to answer), 13% believed it was sometime after March and 5% were under the impression it had already passed. When those surveyed were reminded that they could be fined for not obtaining coverage, half said they would remain uninsured while 40% said they intended to get coverage. About two-thirds (67%) of the uninsured said they have not tried to get insurance for themselves in the last six months compared with 33% who said they did. The requirement to obtain coverage or be fined remains an unpopular element of the law: 64% of the public has a somewhat or very unfavorable view of it compared with 35% who see it positively. Kaiser found the public’s view of the law overall remained negative, but reported the gap has narrowed to 8 points, compared with a recent high of 16 points in November and January. Currently, 46% of Americans have an unfavorable view of the law compared with 38% who see it positively. A Pew Research Center survey conducted Feb. 27-March 16 found the public disapproved of the law by a 53% to 41% margin. One other finding from Kaiser: Many Americans appear to be getting tired of the debate over the law four years after its enactment. Just over half (53%) expressed that view and said they wanted the country to move on to other issues while 42% believed it was important for the debate to continue.